No more ash emissions have been detected from the volcano after the violent explosion Wednesday afternoon (16:10 AKST 21 Dec = 01:10 UTC 22 Dec). However, at least minor intermittent volcanic activity seems to have occurred after this powerful explosion as well. Alaska Volcano Observatory (AVO) reported that seismicity had abruptly declined to low levels following the eruption. AVO lowered the alert level to orange in the evening. The next morning (yesterday 22 Dec 01:20 local time), tremor (inferred from seismic recordings on neighboring islands) climbed again to high levels, probably due to volcanic surface activity, but no ash emissions could be identified in satellite images. The seismic activity began to decline yesterday afternoon again and has remained low with no other indications of new activity so far. 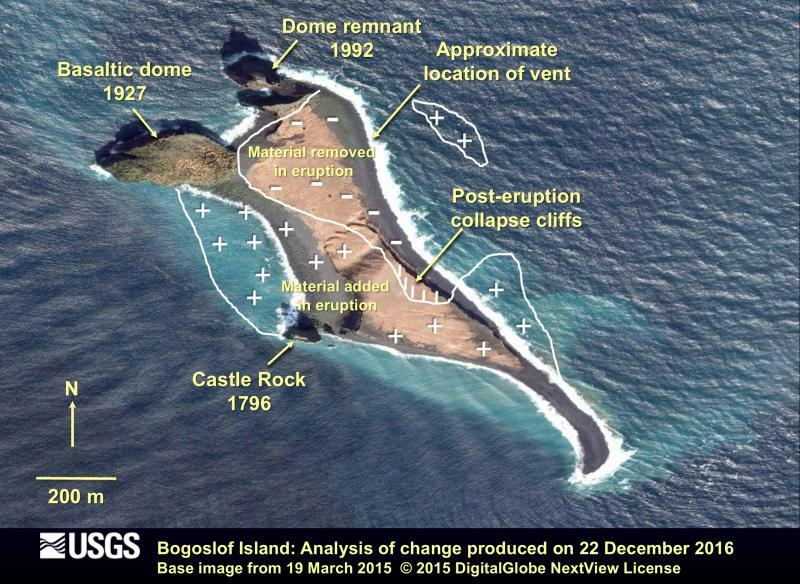 "... a new, small island has formed just offshore of the northeast end of the main island. The former shore and much of the northeast side of Bogoslof Island adjacent to this island has been largely removed, and deposition of material has occurred on the west side of the island. The excavated area of the former northeast shore is likely the vent for this recent eruption, which appears to be just below sea level." Bogoslof volcano Volcanic Ash Advisory: NEW ERUPTION AT 22/0130 UTC.